Complete automation of machine operation requires a means for feeding and retracting the tool from tape commands. A line of pneumatically operated spindle feeds has been developed to perform this function with SLO-SYN Numerical Controls. The spindle feeds provide all the operational characteristics desired: fast initial feed rate followed by slower rate for machining portion of stroke; pecking cycle for deep-hole drilling; tapping capabilities; and adjustable feed rate. Around 1967 the first SLO-SYN Power Spindle Feed was made. It was designed for mounting on Bridgeport Milling Machines fitted with SLO-SYN point-to-point or contouring N/C. The spindle feed provides automatic tool feed and retract and can be actuated manually or from tape. 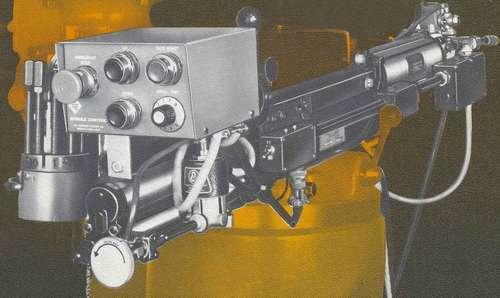 Parts supplied include an air-actuated, hydraulically controlled spindle feed, a control panel, a 10-station depth-stop turret and all necessary cables and air supply accessories. Complete mounting hardware is provided to assure fast, easy installation. The spindle feed gives a maximum spindle stroke of approximately 5/1. An air cylinder provides rapid feed for the first part of the stroke. A hydraulic control, which takes over at the point selected on the turret depth stop, provides carefully controlled tool advance for the remainder of the stroke. Advance and retract rates are fully adjustable. The spindle feed is supplied with a "Lubri-Air" control unit, 6' of %/1 diameter flexible air hose and a %" quick coupler. The turret has 10 individually adjustable depth stops and can be indexed from one stop to the next from tape. Each stop has adjustments for both feed engagement points and depth. The spindle feed advances the tool at rapid feed until the selected feed engagement point is reached. The tool will then advance at the slow feed rate until the depth stop is reached. The control panel mounts on the forward part of the spindle feed within easy reach of the operator. Controls are provided for manually actuating the tool feed and retract motions and for remote restart of the NjC after a tool change. A Dwell Time control adjusts a built.in timer to provide any tool dwell from 0.25 to 15 seconds. During drilling operation, the spindle feed will stay down for the preset dwell time before retracting to assure that it has fully reached the depth stop. When the tool advances during milling, positioning will not begin until after the dwell interval. An Emergency Stop button stops all positioning motion, retracts the tool and stops the tape reader. 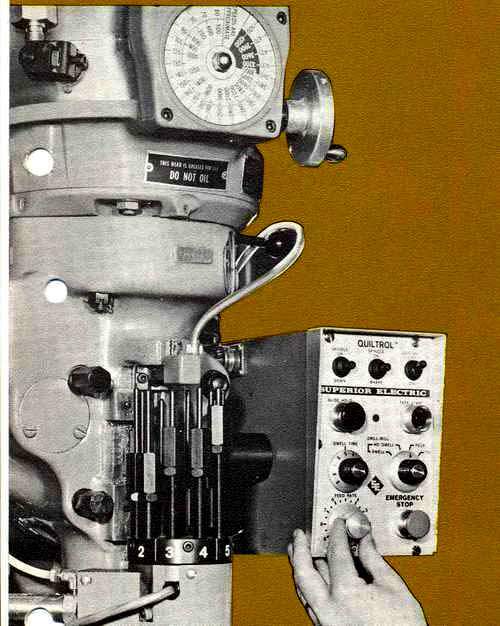 The production of the Quiltrol Actuators started around 1970. 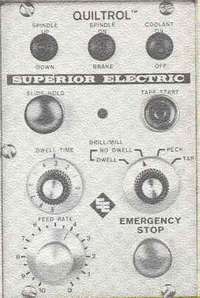 They had all the operating features needed to handle virtually any machine operation. Each actuator includes a control head, autoamatic 10-station depth stop turrer, air filter and regulator. All components of the spindle feed are fully enclosed for safety and protection from dust and chips. The quill can be manualy operated without disengaging the actuator for use when setting up. 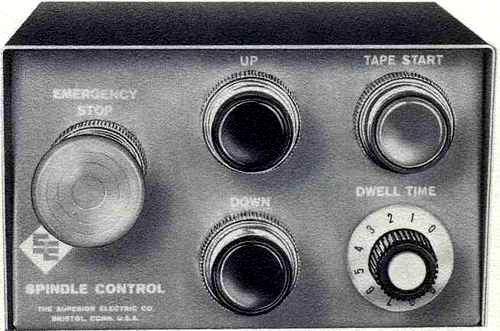 The tape-actuated turret has ten stations with individually adjustable feed engagement controls and depth stops at each station. The turret can be easily detached with the feed and depth stop adjustments in place, allowing the entire setup to be retained for future production of the same part. In the pecking mode, the unit will periodically raise the tool from the work to clear all chips and allow coolant to flow into the hole. The tool will retract just beyond the original feed engagement point and will return at rapid speed to approximately 1/32" from the previous depth, then change to slow feed. When operating in the tapping mode, the unit will feed and retract the quill at the same rate, eliminating the need for synchronizing separate feed and retract settings. An Emergency Stop button located on the panel will stop all table motion, retract the tool, turn off the spindle motor and coolant and apply the spindle brake. Table motion can be interrupted at any time by pressing the Slide Hold button on the actuator panel or on the N/C. A lamp on the N/C panel will indicate when the Slide Hold is activated. The Tape Start function can be initiated from the actuator control panel or from the N/C. When operating in the Drill/Mill mode a Dwell Timer controls tool dwell interval. During driljing operations, the tool will stay down for this preset interval before retracting. For milling, the tool must remain at the bottom of its stroke for this interval before table motion will begin. A No-Dwell mode can also be selected. The motor control allows starting and stopping of the spindle motor and coolant pump from tape or from the actuator control panel. Contacts are also available to operate a lubricant pump for the machine lead screws and ways. Motor control part numbers for specific spindle horsepower ranges. The brake control kit is used in conjunction with the motor control. It consists of an air cylinder and the parts needed to power the existing manually operated brake. The brake can be actuated and held on by the motor control. Spare turret and pin assemblies are offered for use where it is desirable to retain feed and depth stop adjustments for specific part requirements. The assembly includes ten depth stops and feed engagement pins and a mounting drum.